Like most book artists, I spend a potentially unhealthy amount of time alone in the studio. To take a break from the quiet, I started listening to podcasts and became immediately addicted. For those who might be unfamiliar, podcasts are a series of audio or video files available for download, usually through a subscription application such as iTunes (which originated the name “podcast,” as in iPod+broadcast). They are usually free, but many producers offer bonus content for a nominal fee, or paid subscription plan. What I love about the format is that (for better or worse) anyone with a microphone and internet connection can produce a podcast. Sure, there are large-budget podcast production companies out there, but the ones I find most interesting are the passion projects of individuals. There are currently over 500,000 active podcasts being produced, so it is quite easy to fall down a rabbit hole of obscure and niche topics. For example, did you know there is a podcast entirely about the world of pen collecting called The Pen Addict? There is also one called Food and Chair Magazine where every week the hosts try out a different food while sitting in a different chair. 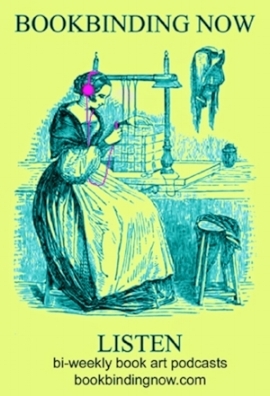 And of course, there are even book arts-related podcasts. Every other Wednesday, you can hear interviews with fascinating members of the book community. Each episode features a conversation between Susan Mills and contemporary bookbinders, printers, and artists such as Keith Smith, Daniel Kelm, Peter Koch, and Buzz Spector, just to name a few. This podcast is unedited, so it feels casual and raw. Bookbinding Now started in 2011 as a collaboration with Full Tilt, a collective that teaches bookbinding classes and workshops. This is an informative podcast that boasts an impressive 120+ episodes to binge. If you are looking for a fun, light-hearted podcast that offers a behind-the-scene peek into a working bookbindery combined with a whimsical audio-drama all in under 10 minutes per episode, then Tedorigawa Bookmakers is THE ONE. George Stenson is a charming host as he discusses works in progress, followed up with a comical self-produced and self-acted drama about bindery happenings. It is such an entertaining and delightful listen. This is a new favorite that I have been enjoying immensely. Self-proclaimed “novice printer” (although based on the impressive level of information presented in the podcast, I think he’s selling himself a bit short), Jordan Berry talks about all things letterpress and about his own journey to start a printshop. 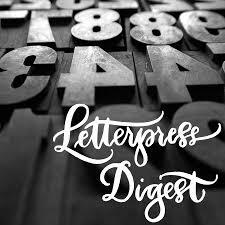 Since starting in mid-2017, Letterpress Digest already has 8 incredible episodes all about “talking shop” with top-rate printers from Boxcar Press, Ladies of Letterpress, Hamilton Woodtype, and more. The guests are so generous and approachable with their knowledge, and it’s really fantastic to hear how these printers all fell in love with letterpress. Jordan Berry is a great host, and makes sure that the material is broken down enough to be enjoyed by newbies but interesting enough to keep the attention of experts. A grandfather in podcast years, Book Artists and Poets was initiated by University of Alabama’s Steve Miller in 2005. Though published irregularly (the last episode appears to have been in 2016), there are over 200 interviews that explore the lives of artists who work in books, including bookbinders, paper makers, printers, and poets. Steve Miller coordinates the MFA in Book Arts Program at University of Alabama and is the proprietor of Red Hydra Press, so it is always interesting to hear his conversations with other professionals in the field about craft, sources of inspiration, aspirations, and their careers. Helen Hiebert is an artist with a love for paper: handmaking paper, selling paper, teaching papermaking, blogging about paper, and now podcasting about paper. The aptly named Paper Talk features interviews with professionals in the field of handmade paper. This monthly podcast tell stories of how these makers discovered paper, how they’ve set up their studios, and share tricks and tips of the trade. I enjoy listening to Paper Talk because as I am not a paper maker, the podcast delightfully reminds me how much there is to learn just within the “small” world of book arts. “Wait, did you just write a whole blog post so you could talk about your own podcast?” you might be asking. “Nooooo”, I answer… Books in the Wild is produced monthly (or close to monthly) and every episode is about a different book art or book history topic. I try to choose topics that are interesting to book artists, but also intriguing to casual fans of the book. Past episodes range from the story of The Wipers Times (a British letterpressed newspaper printed in the trenches during WWI), to the history of a medieval witch hunting guidebook, to Basic Book Art Trivia to introduce newcomers to the field. I hope that these book art podcasts are as enjoyable for you as they have been for me. I love that members of the book community are branching out into this platform to share information, broaden our audience, and just have fun. Whether you are a fellow podcast addict or whether you had to Google the word “podcast” during this blog post, you should give these a listen. I’ve learned, laughed, and found inspiration from these fellow artists, and I think that you will too. Tell us about your favorite podcasts in The Community.